Car window tinting has become very popular in almost every part of the world. There are numerous reasons why tints for a vehicle deserve to become more common day by day and successful including privacy, passenger security and style. But let’s start from the beginning. What is a car window tint? It is a tint that is applied to the windows of your car using a strong adhesive that can hold the glass of the window together. Apart from many advantages, the film can prevent a glass from shattering and makes cleaning windows easier. There are lots of things that you should know about tints. Below I will mention some of them. Car tints come in a wide range of colors including blue and grey, the most common colors used are charcoal and brown that may come in high performance tint- specially made for avoiding solar heat and ultra violet rays. In this modern world, sometimes tints are purchased for car style, so you will be able to find tints with different shades and some special effects like-metallic, mirrored, semi reflective. The problem that many people have with doing all the cuts for their cars windows is they don’t understand the best way to do it. The best way to install window tint is to actually take the glass out and then lay a larger piece of tint over that window. What this does is gives you the ability to cover the entire window and then when the window is fully tinted and the film is dry, you cut it to size. The reason why this is a problem for most people is because they don’t know how to take out auto glass and they don’t want to waste money on more tint if they don’t need to. This is why using precut window tint kits make this entire process much easier. Online – The best place to buy precut window tint kits would be on the internet. You can find them on sites like Amazon, eBay and other large retail sites or you can buy them from smaller tint retailers. Whatever you decide to do is up to you, just know that you will get a much better deal online and you will have a large selection of colors and shades to choose from. Professional Tint Installers – The nice thing about professional tint installers is they will sell you precut window tint, however, they will charge you more for it. Professional tint installers normally buy their tint precut in order to make their job a lot easier and because of that you can go to them and buy it off of them. From Car Dealers – Now, if you can’t find what you are looking for anywhere else, then go to a car dealer that deals with your make. The reason this is one of the last places you should looks is because they will charge you much more for it and you won’t have as many options. Being that car dealers normally only sell the manufacturers original tint, you must make sure your car had tint installed directly from the manufacturer or you won’t find it here. What you must understand is that precut window tint kits will make your task a little bit easier, however, they won’t make the install so simple that a newbie can do it successfully the first time. Installing window tint will take some time and you need to know as much about it as you possibly can. That is why I highly recommend that you first learn how to tint car windows before trying it on your own. It is said that before you go to tint your car windows, firstly, you should be aware of the laws for citizens that govern your state as they are different for each country, you should study special jurisdiction to find out if it’s possible to tint your car maximally or how much percent of tint is used for car windows. You can find additional information about your country line, but if you fail, try to find the resources and technical details in your local Transportation department . So, check your municipalities to find out more about restrictions on tinting car windows. Some places totally restrict tinted windows whereas others allow you to use some percentages from 25 up to 70 for light transmission. There are also very light tint films as well as ultra dark tints sometimes called limo tints with super darkness. The only reason why some countries don’t allow 100% car tint and require car tints to be allowed with a certain degree of visibility is the desire for jurisdictions to be able to identify car drivers and their passengers. Therefore, before choosing to tint your car windows, you must check with your local authorities and be aware of government regulations about the allowed degree of car tint. Nowadays window tinting is a thriving business that is going to rule the auto world. Using tints on car windows is a common experience throughout the world. There are many palpable benefits and features that I would like to mention below. The benefits of this steadily growing trend include drivers’ safety, blockage of UV rays, concern of privacy and more. I will talk about the details of each benefit below. Tinting provides good visibility for people who are inside your car. It helps you to take the control of the amount of rays and lights that get into your car. How is it possible? With tint films, you are able to make sure that sunlight is coming in your car but limit the light, so its effect is not too strong. Automotive tint is very useful as it rejects the harmful ultra violet rays that come from the sun. They can really damage your car interior not to mention your skin and harm that comes from direct sunlight. Direct exposure to the sun causes wide range of skin aging, dryness, itching and cancer. Car window tints specially designed to deflect sunlight successfully reject UV lights so they upholstery protect the eyes of a driver from sun glare and severe exposure to sunlight. So with tints you can reduce infrared and ultraviolet (UV) light from permeating through the windows. If one day, you will have an accident that may cause windows to break, be sure that window tint film can hold the shards of shattered glass. So you and car occupants are maximally protected from injuries caused by broken glass. Of course, this feature is related to the quality of tint- the higher the quality of film, the better is can hold glass. Also, adding films to windows makes them more durable and resistant to breaking. So, with tints you can feel more confident in break-in attempt or an accident. If summer is very hot in your country than tint might really help you to keep cool. If your car windows are tinted remember that your non tinted car is 60% warmer than yours. Car window tinting protects your car from overheating. You can keep cool and enjoy longer road trips, especially in the hot days of summer, when your car has tinted windows, your salon and things in it are exposed to direct sunlight. The heat of which will damage them including electronics. By blocking and limiting the permeation of sunlight with tinted windows, you can save the color and design of your car interior, salon dashboard and some electronic appliances. Aside from its safety or privacy offering abilities and many other advantages , car window tinting can also be used to make your auto much more attractive Car window tint gives your car a totally new look .Cars with tinted windows have a sleek appearance that gives the car a classy, sophisticated and sometimes modern look. Nowadays, car window tinting proves more to be a necessity as well as a luxury. So, as you see the technology of Tinted windows has much more benefits than you expect. Tinted car windows benefit drivers in many mentioned ways- they enhance the privacy and security of the car as well as people in it. All of them make your car a more pleasurable environment. You must remember that benefits related to tinted windows depend on the tint quality of the tint. This issue is especially important since poor quality tint can cost you money and do no good for you. How much money do you have? Do you have enough to hire somebody to tint your windows? Most people that look into getting their windows tinted forget to do one thing, compare the cost of getting their windows tinted from multiple sources. If you know how to apply tint yourself then you only need to look at the price of materials instead of materials and labor. If there is one thing I know about tinting your car windows it is that it is not cheap, especially if you have to hire somebody to do it. That is exactly why you should learn how to tint car windows. If you don’t have time to learn then just know that it will not cost you an arm and a leg but you will feel the impact when hiring somebody. For most vehicles the cost of window tinting will be anywhere from $200 to $500. This cost will include all the necessary materials to conduct the job and the rest of the money goes to the cost of labor. When it comes to window tinting one of the things that you need to understand is that about half of the cost is geared towards labor. If you have never tried to tint your own windows then you don’t know how difficult it can be and that is why the cost is so high for it. One thing that I want to make sure you understand is that tinting you windows is going to make a big difference on your car in the future. The reason I say this is because most people think that window tint is only for looks when in reality it works good to keep your dashboard clean and vibrant for years to come. Trust me on this one, you need to have window tint in your car or else who knows if your car will look as good later on. When it comes to car window tint colors you truly have an unlimited amount of options that you can choose from. A lot of people choose black window tint, however, there are many more colors than this. Although, you can choose between a bunch of different colors, I would strongly recommend that you go with black because it makes any car look better and it blocks out more sunlight than a colored tint does. If you want to find the most car window tint colors, then you should look around online. The reason why I suggest looking for different colored window tint online is because websites will have more of a selection and you will get a much better deal as well. Don’t be like most people and rush into buying window tint from a local auto shop because they normally increase the price of car window tint by quite a bit. Trust me on this one, you are better off buying window thing online from a site like Amazon, eBay or even Overstock. One other thing that I want to make sure you understand is that some states will prohibit certain car window tint colors. This is why you will need to check with your state to see which colors you can and can’t have on your car before you make a purchase. Just know that most states will allow any color as long as it is not too dark with little visibility. The final thing that I want to leave you with is that you should see what the different car window tint colors look like on your car before you pay to have your windows tinted. Being that tint can cost a good amount of money you won’t want to spend the money without knowing for sure that the color you picked will look good. It is very entertaining and easy to mount the tints on your car. Firstly, you should clear windows inside and out to remove all the dirt. If you don’t have pre cut tints, measure the window and try to trim the film to the size of your windows with a razor. Bear in mind to tint the smallest flat as you will get used to it. Position it on the window and trim the upper edges of the film. You should start working from the bottom and then reach the top or vice versa. Remember to work in a dust free place where temperature is below 38 once you make sure there are no air bubbles, and then you can move on. If there are, push them out to the edges of the film. Spray the window from inside with application solution. When it is done, peel off the film liner and spray the rest. If you don’t trust yourself in the results of your own work then ask or an expert from the shop to help you. But you must give a try as applying the tints yourself is extremely easy and takes just few minutes. All in all, the things listed above might really help you to become aware of car tints and all the issues related to them. When it comes to removing tint from car windows there is a method to this madness. Most people think they can simply pull the tint off. Honestly, this doesn’t work quite like you would imagine. 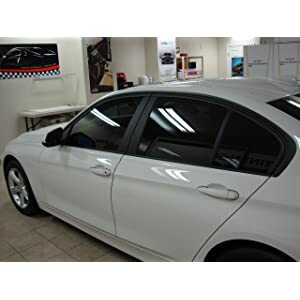 If the tint was placed on the windows with some kind of adhesive, then you will need to get a tint removal spray or a hot air gun in order to get it off. The tint removal spray works by breaking down the adhesive causing it not to work anymore. The hot air gun simply heats the adhesive back up so that it turns into a liquid which will allow you the time to remove the tint. Both of these will work, however, sometimes you will need to use both methods. The trick to removing tint from car windows is very simple, start from one corner and slowly pull the tint down. A lot of people try to quickly remove the tint and that just doesn’t work. What you want to avoid is tearing the tint because once that happens you will have to start all over again in another corner. My advice would be to pull the tint as hard as you can as long as it keeps coming up, once it stops then you need to stop as well. Another tip for removing tint from car windows is to use a razor blade. The way you do this is by taking the razor blade to the end of the tint until you can peel it back a little bit. Now, you will still have to use a tint removal spray or a hot air gun but instead of just pulling you will run the razor blade underneath the tint, ensuring that the adhesive comes up with it. This will take a little bit longer but it will clean the window in the process, which is a great benefit of doing it. As you can see, removing tint from car windows is not that difficult. A lot of people think they have to get their tint professionally removed but that is not the case. Just know that you can remove tint from car windows on your own as long as you know how it is done.